Charles Street, on which the Great House that we saw last fortnight stands, also has some other stately buildings. Strolling further south on it, pause at the last house on the right, just before the erstwhile San Thomè Gate of the Fort that now leads to the Military Police headquarters. One half of that stately home has completely collapsed, while the other barely stands, held in place rather ironically by the roots of a huge banyan tree growing out of it. If you peer closely at a slate panel on the extreme edge of the house you can make out just three letters of an inscription. These read ‘TON’ and they are all that remain of the full text that once read “Colonel the Hon. Arthur Wellesley, later 1st Duke of Wellington, lived here – 1798.” Yes, this was indeed the residence of the man who would one day defeat Napoleon and also become Prime Minister of England twice. 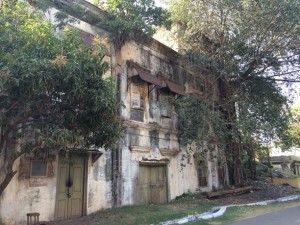 Wellesley House as seen from the Fort’s San Thomé Gate. Arthur Wellesley was of aristocratic stock, for he was the fourth son of the Earl of Mornington, born to the latter’s Countess Anne in 1769. In keeping with the choices open to all younger sons in the British aristocracy, especially those of highly placed but impoverished families, he joined the army in 1787, being commissioned as an ensign. His eldest brother Richard had succeeded to the title and was of great help, ensuring that Arthur was an aide de camp to the Lord Lieutenant of Ireland and also became a sitting member of Parliament. As time went on, Arthur, with financial assistance from his brother, was to repeatedly purchase promotions in the army, though it cannot be denied that he did have a flair for military matters. By 1796, he had become a full-fledged colonel and was then serving in the 33rd Regiment. That year, he set sail for Calcutta. Having spent a few months there, he went on an expedition to the Philippines and returned in 1797, only to learn that the new Governor General of India was none other than his elder brother, Richard, the Earl of Mornington. In the meanwhile, even before his brother took charge in Calcutta, Arthur Wellesley had begun travelling around British possessions in India, his stature now considerably enhanced by his brother’s appointment. It is therefore in that light that we must view his being allocated such a large and brand new house (it was built in 1796) in the Fort when he reached Madras. According to Sir Charles Lawson in his Memories of Madras, Wellesley also “occupied for many a day” a small house at Teynampet, Madras “conducting incessant, and sanguinary warfare against the mosquitoes bred in the adjacent Long Tank.” Governor Lord Hobart had left the city by then leaving General Medows as the acting head of the administration. In 1798, Madras got its next Governor in Edward, the Second Lord Clive, son of Robert, the man who got for the Company much of its dominance over the Carnatic and its possession of Bengal. But Edward was not a patch on his father, preferring to lead a life of luxury and pomp. The Wellesleys, Richard and Arthur, did not think much of him. This was partly the reason why they chose to largely bypass him when it came to the final war with Tipu Sultan. The conflict became urgent when news came of Napoleon landing in Egypt. It was believed that he would soon be on his way to India. Rumours gained ground about Tipu being in correspondence with him. The British were also worried about a large French presence in the court of the Nizam of Hyderabad. Fearing quite correctly that Lord Clive would do nothing about it, Richard Wellesley, the Earl of Mornington and Governor General of India, decided to take a leaf out of a predecessor’s book. In 1792, Lord Cornwallis shifted his office from Calcutta to Madras to wage the Third Mysore War. Now, Richard Wellesley would do the same. Madras was however not enthusiastic about battle with Tipu. The Chief Secretary, Josiah Webbe (who has a memorial for himself in St Mary’s Church), remonstrated stating that the Government was unprepared – the deficit stood at eighteen lac pagodas and the Government’s 8 per cent bond carried a 20 per cent discount on it. But the Governor General would have none of it. Fortunately for him, the Commander-in-Chief, George Harris, was of the same view and it was decided that battle would commence. Arthur Wellesley and his 33rd would be a part of the force. The march to Srirangapatnam began in February 1799, the Governor General remaining behind in Madras and keeping a close watch from there. His brother’s role in the war against Tipu always remained a matter of controversy. He certainly lost his way and on April 6th entered a dark grove at Sultanpettah where, in the confusion, troops of his regiment probably shot at each other. Be that as it may, the assault on Tipu, led by Sir David Baird, was successful and Mysore soon fell. Rather interestingly, and perhaps not surprisingly, it was Arthur Wellesley who was now given the command of Mysore, much to Baird’s disgust. In all the jubilation over Tipu’s death, this was forgotten. There were promotions all around. Harris became Lieutenant General and several years later would be elevated to the peerage, becoming 1st Baron Harris of Seringapatam and Mysore. Lord Mornington became the Marquis of Wellesley and left for Calcutta, but not before sitting down for a portrait of himself, depicted against a backdrop of the flagstaff of Fort St George. Arthur Wellesley went on to participate in the second Anglo-Maratha war in 1803 where he scored significant wins at Assaye, rising to the level of Major General. In 1804, he applied for home leave and when this was not forthcoming, resigned his commission. He came to Madras en route to England where a glittering reception awaited him. It was resolved by the European residents that a portrait of his be commissioned for the Long Room of the Fort Exchange building. He was received in a grand durbar at Chepauk Palace on February 18, 1805 by Nawab Azim Ud Daulah, the scene being the subject of a sketch by George Chinnery for a full length painting that was never done. On March 2nd, he was given a grand farewell dinner at the Pantheon, Egmore. A full-length portrait of his was unveiled on the occasion, as reported by the Madras Gazette. Wellesley returned to England with a large fortune, chiefly prize money. There he married his childhood flame, Kitty Packenham – the union was, however, not happy. He was however destined for greater glory. He scored several victories for England, rising steadily in rank and title. In 1815, he defeated Napoleon at Waterloo and earned his nation’s eternal gratitude. He was elevated to the highest rank in the peerage, becoming the Duke of Wellington. He also became Prime Minister of England twice, his first tenure being from 1828 to 1830 and his second for a brief while in 1834. 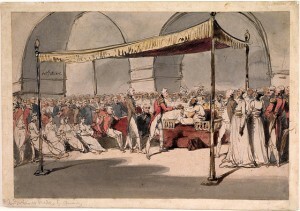 Arthur Wellesley being received by the Nawab Azim Ud Daulah at Chepauk Palace (by George Chinnery). In 1808, the European residents of Madras, acquired by public subscription, a portrait of his. This had been executed a year earlier by John Hoppner of the Royal Academy. The portrait hung for several years at the Banqueting (now Rajaji) Hall and after Independence was quietly consigned to the storerooms of the Madras Museum. His house in the Fort is now coming apart, brick by brick.